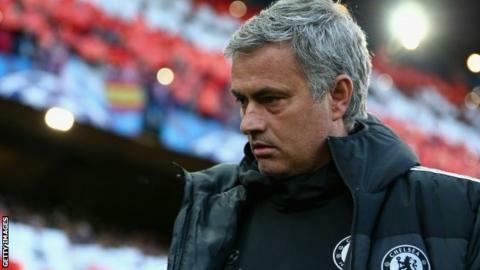 Chelsea manager Jose Mourinho refused to say whether he will field a weakened team for their Premier League match against Liverpool at Anfield on Sunday. He has previously hinted that he will prioritise Wednesday's Champions League semi-final against Atletico Madrid, the first leg of which ended goalless. Mourinho said on Friday: "Wait for Sunday [when] you will know our team." The Chelsea boss added that he does not feel free to speak his mind after being given another FA misconduct charge. The latest, issued earlier this week, was in relation to comments Mourinho made following the defeat by Sunderland at Stamford Bridge last weekend. He congratulated both referee Mike Dean for his performance - which he described as "unbelievable" - and Mike Riley, head of refereeing body Professional Game Match Officials Limited, in a television interview. "Every time I speak there is a consequence," added Mourinho. "Even if I say that a referee was amazing that was a reason to be [given] a charge. Chelsea are not expected to face punishment from the Premier League if Mourinho decides to field a weakened team as regulations have been relaxed since Blackpool were fined in 2011. Action is now only likely if they select several under-21 players not in their 25-man squad for Premier League games. Even with a team comprised mainly of fringe players, Chelsea's starting XI would still be likely to be more expensive than Liverpool's in terms of transfer fees. Mourinho also said he was disappointed that Sunday's fixture had not been moved forward to Saturday. "I think Chelsea fans would like Chelsea Football Club to be respected and to get the respect Chelsea Football Club deserves," Mourinho said. "Chelsea fans know what Chelsea did for English football in the last 10 years. They are the most important football club in this country in European competitions. "Chelsea fans think Chelsea deserve more respect than they are getting." With three domestic matches remaining, Chelsea - who last won the title in 2010 - are second in the Premier League table, five points behind leaders Liverpool, and only a point clear of Manchester City, who have a game in hand. Midfield duo Frank Lampard and John Obi Mikel could both feature at Anfield as they are suspended for the second leg against Atletico. Nemanja Matic and Mohamed Salah have also been tipped to play against Liverpool because they are ineligible for European competition this season. But goalkeeper Petr Cech, skipper John Terry, midfielder Eden Hazard and striker Samuel Eto'o will miss out through injury, while Ramires is suspended. The Brazilian midfielder starts a four-match ban for violent conduct following his off-the-ball incident last weekend with Sunderland's Sebastian Larsson.